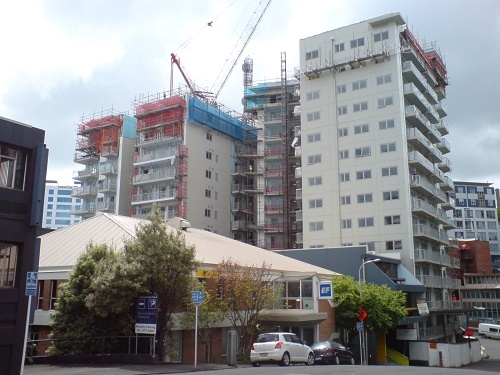 If everything goes according to the Unitary and Governmental plans, Auckland is about to embark on an apartment building spree like it has never seen. The Unitary Plan eased the rules so a lot more apartment buildings can be built on a lot more land in and around the Auckland CBD. Assuming no major legal hiccups, the Unitary Plan will go live this weekend, in theory unleashing a wave of apartment and town-house development. Even Prime Minister John Key is encouraging first home buyers and others to buy apartments, given they are relatively less expensive than stand-alone homes in Auckland -- at least on the face of it. There are plenty of nerves around though. Investors have always been wary of apartments, given the legacy of leaky buildings, body corporate problems and surprisingly big bills for maintenance and insurance that get tacked on to body corporate fees. The surge in demand from investors in recent years for 'sausage flats' on sections, or for simple houses on big sections reflects that lack of confidence in apartments and townhouses in larger complexes. Investors can see the real money to be made is in the appreciation of land prices. They have quintupled in Auckland since 1996. The problem with apartments for investors, and increasingly for owner-occupiers, is that there is not enough land built into the price to get the necessary appreciation to create the necessary tax-free capital gains. The problems with lease-hold land have also repeatedly undermined confidence in apartments. The Government passed the Unit Titles Act in 2010 with the aim of making it simpler and cleaner for apartment buyers, but there are concerns the way it is being operated could restrict the demand for apartments and potentially alienate a whole new generation of buyers -- including those taking up the suggestions of the Prime Minister. Before the passing of the Unitary Plan, a group of experts on the laws around apartments and how body corporates operate proposed a range of legislative and other changes to improve confidence in the sector in the long run, and Building and Housing Minister Nick Smith has said this month he is seriously considering tweaking the regime for apartments. He acknowledged the Government had not focused enough on a complex area. The Unit Titles Working Group, which includes the Auckland District Law Society, the Home Owners and Buyers Association (HOBANZ), Crockers and the Real Estate Institute of New Zealand, proposed changes to Smith in May that would include much clearer disclosure for buyers, tougher regulation of body corporate managers and a new Ombudsman scheme for dealing with disputes. HOBANZ Chief Executive Roger Levie says many apartment buyers only get a limited amount of information about how the buildings are being managed before they sign on the dotted line. Often they don't have a clear idea of the body corporate's repair and maintenance plans or its finances. Many body corporates under-spend or under-plan for repairs and maintenance in an effort to keep fees low and attract buyers and investors, but that can mean buildings can need expensive repairs at a later date. "It's only once you're in a contract than you can then start to get some of the additional information, and often that's too late," Levie says. "The long term maintenance planning regime that was introduced under the old act is really not being followed by the body corporates because they don't want to spend the money to get the right sorts of building consultants involved to assess their building, and they don't want to face up to the significant costs they have building up for proper maintenance," he says. Levie is proposing the full maintenance plans and body corporate details are available to buyers before they sign contracts. "When they make their purchase and then find two years later they're up for a couple of hundred thousand dollars to contribute to a re-clad of a building, there's going to be litigation flying and we're already starting to see it," he says. "We've seen the fallout across the leaky and defective properties and it's ruining peoples' lives." The Working Group also suggested Smith look at adopting a Queensland-style system where an Ombudsman adjudicates on disputes, rather than the current system where complainants are eventually forced to go the District or High Courts. For stretched first home buyers, a court action can be intimidating and prohibitively expensive. Apartments can be part of the solution to Auckland's housing supply crisis and can be a foot on the ladder for a generation locked out of a traditional house on a section, but the Government will have to heed the warnings and take up the proposals for better regulation to reinforce and build confidence in these homes for decades to come. A failure risks adding insult to injury for an already struggling cohort of home buyers.